They’re a part of American folk literature that we’ve heard from childhood. Some are based on the exaggerated exploits of real historical figures such as Annie Oakley or Buffalo Bill Cody. Others are real whoppers–Pecos Bill and Paul Bunyan, among them. These are tall tales and Oregon has its share. Paul Bunyan was Minnesota’s colossal King of the Lumberjacks, who, accompanied by his Blue Ox named Babe, created all of the state’s 11,842 lakes with his footprints. But Paul came to Oregon too. One particularly frigid winter every North Woods fish swam south. Paul crossed fresh-water walleyes and northern pike with bobcats, creating fish that grew fur coats in cold weather. 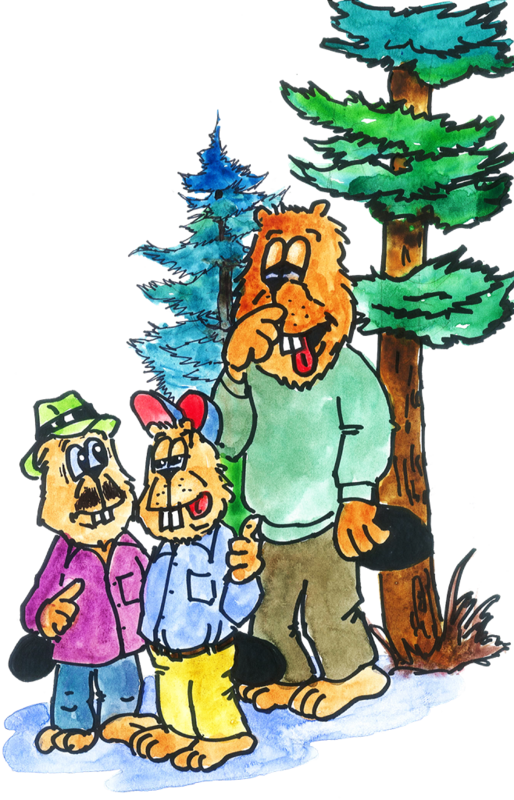 Closer to home, Paul’s logging crew, all giants, too, and each known as Elmer, roofed an Oregon bunkhouse with cedar shakes. The fog was so thick that day the men shingled past the last rafter 40’ up into the air before realizing what they’d done. One year Paul and Babe came to log in Oregon along the Little Gimlet River and built an extraordinarily large cabin. The kitchen alone covered 10 square miles and had a stove about an acre in size that was taller than a pine tree and could melt snow for twenty miles around. (Gimlet Creek is an actual waterway in Baker County). Another yarn tells of a pioneer hunter who came across a hungry cougar on a trail west of the Cascade Mountains. The big cat sprang at the startled man, who then shoved his fist down the critter’s mouth, through its body, and caught the tail. That turned him inside out and it tickled itself to death. Native Oregonian Hathaway Jones (1870-1937) lived along the remote reaches of the lower Rogue River in Curry County and had a contract as a rural mail carrier. He became known as a master story teller who told his tales to the region’s isolated gold miners and homesteaders. One of his shorter anecdotes has him listening to squirrels vocalizing near his home. They were on a big wood chip in a pond, tails up to catch the wind and race around the water. Later, Jones looked at the plate-sized chip, only to find it was a rattlesnake’s scale. The Hathaway Jones Tall Tales Festival has been held annually in and near Gold Beach for many years. The extreme differences in weather east and west of the Cascade Mountains have long been a rich source of fantastic accounts. It seems that in the 1930s a rancher in the southeastern part of the state hoarded well water and distributed it very sparingly to family. On this particular day, he neglected to replace the well’s wooden cover and, as luck would have it, a small dust devil blew through and sucked up all the liquid except one drop. That tiny drip landed on his son, surprising him so much he promptly fainted. The father had to throw two buckets of sand on the child to bring him back to consciousness. This humorous tradition and character sketches continue to enrich our folklore and daily lives.